The man who made a version of Space Invaders that deletes files from your computer every time you shoot an enemy has added a new mode to his excellent mobile solitaire game Sage Solitaire. It’s called True Grit. Lose while playing True Grit too many times and you can never play that mode again. The designer, Zach Gage, isn’t trolling. He just thinks people will appreciate having to make some hard choices. His new update to Sage Solitaire introduces a new “gambling” mode called Vegas Mode that lets players wager fake dollars on their single-player matches in the game. If you lose all of the virtual dollars in your in-game bank, you can pick an option to replenish them. No big deal. No extra cost. True Grit is a twist on that. “If your cash total falls below zero you can never play it again,” Gage told me. I played some. It’s tough. I kept losing my virtual dollars, but I haven’t hit bottom yet. Got that? True Grit mode will reward you if you nearly zero out your fake, unreplenishable bank account, but you will lose access to the mode if you zero out completely. And it’s all subject to how well you play and how much fake money you dare wager on each game. 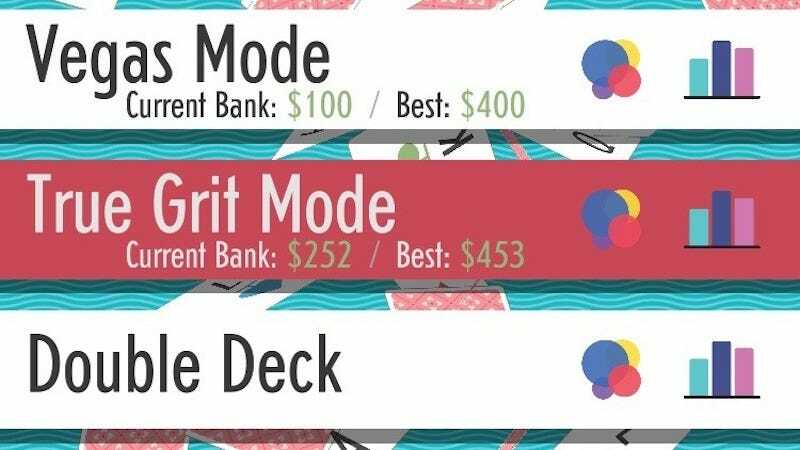 The new modes are available in Sage Solitaire today, though be warned that you have to clear the game’s single deck mode three times to begin to access Vegas Mode and then need to amass $800 (virtual) in the game’s bank before True Grit unlocks. That alone is very tough. Good luck. Sage Solitaire is available for free on iOS with an Android version forthcoming.